Papaya is a fruit that is known for its deliciously sweet taste. With its butter-like consistency and glowing orange flesh, it has been rightly labeled by Christopher Columbus as the “Fruit of the Angels.” However, many confuse this fruit with PawPaw which is quite larger in size and has yellow flesh. Did you know that a Papaya tree is not really a tree? Well, it is a large herb that grows at the rate of two meters in its very first year and then reaching to 6-9 meters in height in its lifetime. If you believe that Papaya is consumed only in its natural form, then here’s what you need to know. Apart from its natural form, some love to have its shake, juice, and smoothie. In fact, young leaves of the Papaya tree is cooked and served just like spinach in many countries across the world. Shimla Hills, one of the leading names in the agro-products industry, handpicks the best Red Papayas from the Southern states of India for its processing into various other quality products such as Red Papaya Pulp & Puree, Puree Concentrate, and IQF. A quality process adhering to all the guidelines is followed right from obtaining the Papaya to its processing. It includes washing, cutting, deseeding, de-stoning, inspecting, etc. The rich and flavourful Red Papaya processed products are used to prepare different food products like fruit bread, muffins, tarts, pie fillings, cakes, icings, puddings, donuts, jams, mixed drinks, fruit bars, milkshakes, and ice creams. 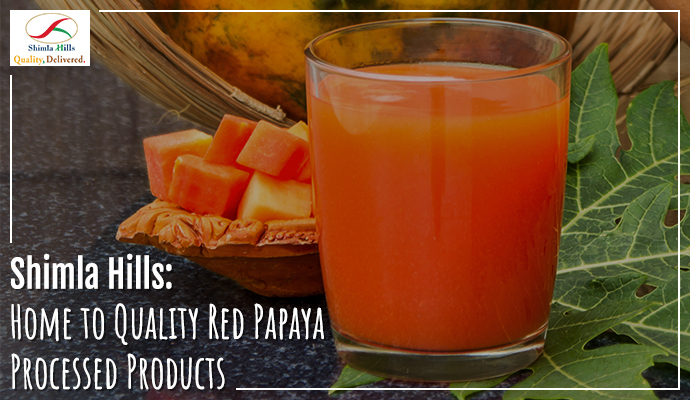 To get your hands on premium quality Red Papaya processed products, book your order with Shimla Hills NOW!